FinFisher is such a complex piece of malware that, like other researchers, we had to devise special methods to crack it. 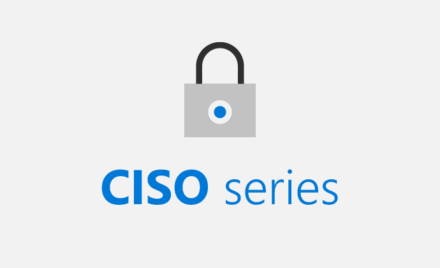 We needed to do this to understand the techniques FinFisher uses to compromise and persist on a machine, and to validate the effectiveness of Office 365 ATP detonation sandbox, Windows Defender Advanced Threat Protection (Windows Defender ATP) generic detections, and other Microsoft security solutions. This task proved to be nontrivial. FinFisher is not afraid of using all kinds of tricks, ranging from junk instructions and “spaghetti code” to multiple layers of virtual machines and several known and lesser-known anti-debug and defensive measures. Security analysts are typically equipped with the tools to defeat a good number of similar tricks during malware investigations. However, FinFisher is in a different category of malware for the level of its anti-analysis protection. It’s a complicated puzzle that can be solved by skilled reverse engineers only with good amount of time, code, automation, and creativity. The intricate anti-analysis methods reveal how much effort the FinFisher authors exerted to keep the malware hidden and difficult to analyze. This exercise revealed tons of information about techniques used by FinFisher that we used to make Office 365 ATP more resistant to sandbox detection and Windows Defender ATP to catch similar techniques and generic behaviors. 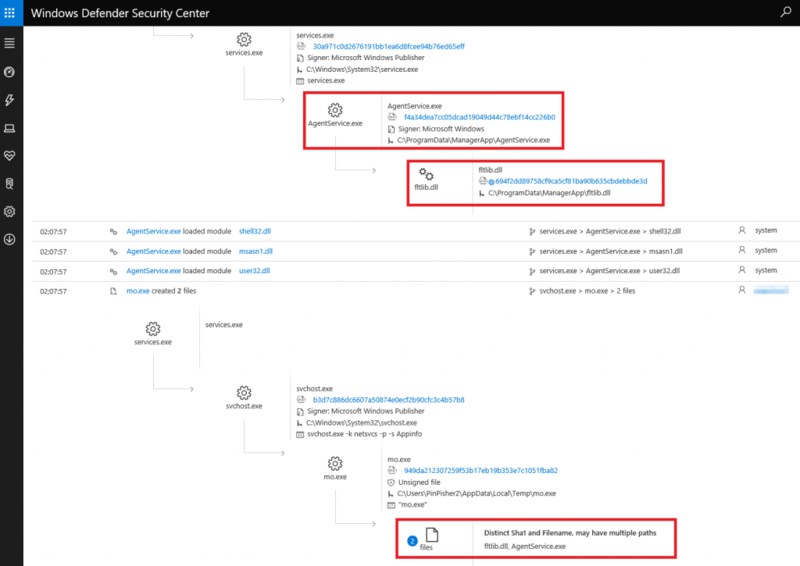 Using intelligence from our in-depth investigation, Windows Defender ATP can raise alerts for malicious behavior employed by FinFisher (such as memory injection in persistence) in different stages of the attack kill chain. 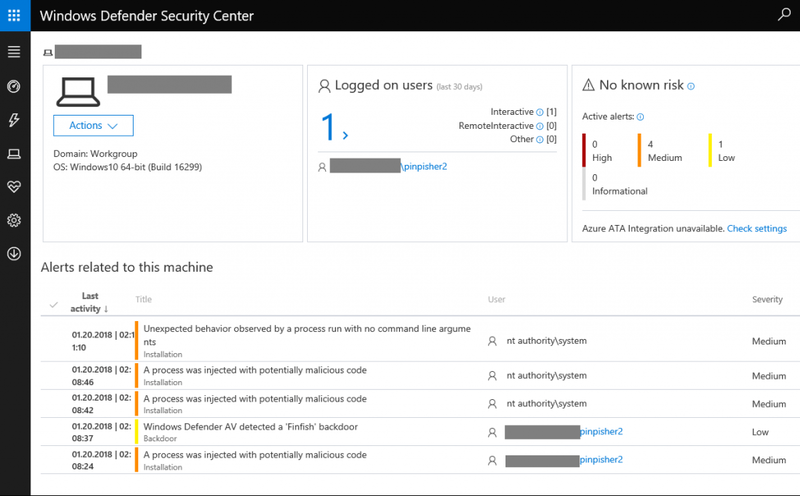 Machine learning in Windows Defender ATP further flags suspicious behaviors observed related to the manipulation of legitimate Windows binaries. While our analysis has allowed us to immediately protect our customers, we’d like to share our insights and add to the growing number of published analyses by other talented researchers (listed below this blog post). We hope that this blog post helps other researchers to understand and analyze FinFisher samples and that this industry-wide information-sharing translate to the protection of as many customers as possible. In analyzing FinFisher, the first obfuscation problem that requires a solution is the removal of junk instructions and “spaghetti code”, which is a technique that aims to confuse disassembly programs. Spaghetti code makes the program flow hard to read by adding continuous code jumps, hence the name. An example of FinFisher’s spaghetti code is shown below. This problem is not novel, and in common situations there are known reversing plugins that may help for this task. In the case of FinFisher, however, we could not find a good existing interactive disassembler (IDA) plugin that can normalize the code flow. So we decided to write our own plugin code using IDA Python. Armed with this code, we removed this first layer of anti-analysis protection. Removing the junk instructions revealed a readable block of code. This code starts by allocating two chunks of memory: a global 1 MB buffer and one 64 KB buffer per thread. The big first buffer is used as index for multiple concurrent threads. A big chunk of data is extracted from the portable executable (PE) file itself and decrypted two times using a custom XOR algorithm. We determined that this chunk of data contains an array of opcode instructions ready to be interpreted by a custom virtual machine program (from this point on referenced generically as “VM”) implemented by FinFisher authors. The main dropper implements the VM dispatcher loop and can use 32 different opcodes handlers. Th 64KB buffer is used as a VM descriptor data structure to store data and the just-in-time (JIT) generated code to run. The VM dispatcher loop routine ends with a JMP to another routine. In total, there are 32 different routines, each of them implementing a different opcode and some basic functionality that the malware program may execute. The presence of a VM and virtualized instruction blocks can be described in simpler terms: Essentially, the creators of FinFisher interposed a layer of dynamic code translation (the virtual machine) that makes analysis using regular tools practically impossible. 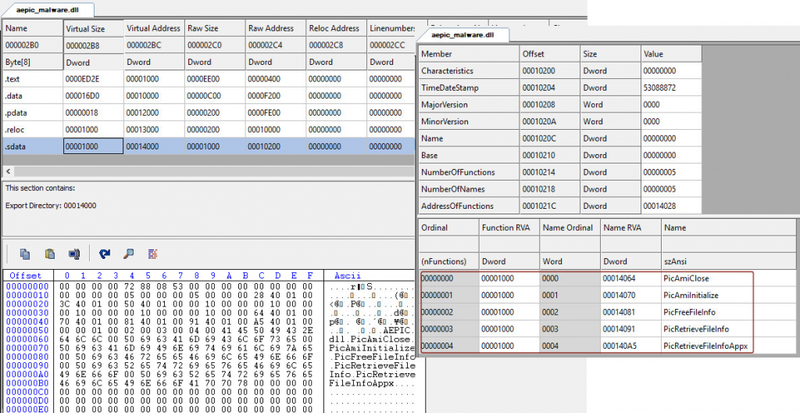 Static analysis tools like IDA may not be useful in analyzing custom code that is interpreted and executed through a VM and a new set of instructions. On the other hand, dynamic analysis tools (like debuggers or sandbox) face the anti-debug and anti-analysis tricks hidden in the virtualized code itself that detects sandbox environments and alters the behavior of the malware. At this stage, the analysis can only continue by manually investigating the individual code blocks and opcode handlers, which are highly obfuscated (also using spaghetti code). Reusing our deobfuscation tool and some other tricks, we have been able to reverse and analyze these opcodes and map them to a finite list that can be used later to automate the analysis process with some scripting. Each virtual instruction is stored in a special data structure that contains all the information needed to be properly read and executed by the VM. This data structure is 24 bytes and is composed of some fixed fields and a variable portion that depends on the opcode. Before interpreting the opcode, the VM decrypts the opcode’s content (through a simple XOR algorithm), which it then relocates (if needed), using the relocation fields. The VM handler is completely able to generate different code blocks and deal with relocated code due to address space layout randomization (ASLR). It is also able to move code execution into different locations if needed. For instance, in the case of the “Execute” opcode (0x17), the 32-bit code to run is stored entirely into the variable section with the value at offset 5 specifying the number of bytes to be copied and executed. Otherwise, in the case of conditional opcodes, the variable part can contain the next JIT packet ID or the next relative virtual address (RVA) where code execution should continue. Of course, not all the opcodes are can be easily read and understood due to additional steps that the authors have taken to make analysis extremely complicated. For example, this is how opcode 0x1A is implemented: The opcode should represent a JB (Jump if below) function, but it’s implemented through set carry (STC) instruction followed by a JMP into the dispatcher code that will verify the carry flag condition set by STC. Even armed with the knowledge we have described so far, it still took us many hours to write a full-fledged opcode interpreter that’s able to reconstruct the real code executed by FinFisher. 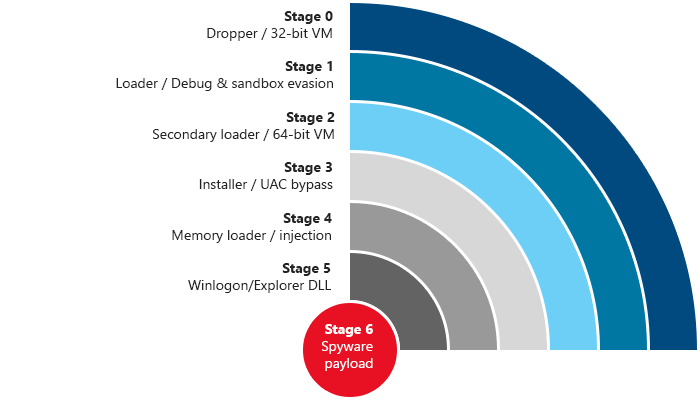 The first stage of FinFisher running through this complicated virtual machine is a loader malware designed to probe the system and determine whether it’s running in a sandbox environment (typical for cloud-based detonation solution like Office 365 ATP). The loader first dynamically rebuilds a simple import address table (IAT), resolving all the API needed from Kernel32 and NtDll libraries. It then continues executing in a spawned new thread that checks if there are additional undesired modules inside its own virtual address space (for example, modules injected by certain security solutions). It eventually kills all threads that belong to these undesired modules (using ZwQueryInformationThread native API with ThreadQuerySetWin32StartAddress information class). The first anti-sandbox technique is the loader checking the code segment. If it’s not 0x1B (for 32-bit systems) or 0x23 (for 32-bit system under Wow64), the loader exits. If these initial checks are passed, the loader builds a complete IAT by reading four imported libraries from disk (ntdll.dll, kernel32.dll, advapi32.dll, and version.dll) and remapping them in memory. This technique makes use of debuggers and software breakpoints useless. During this stage, the loader may also call a certain API using native system calls, which is another way to bypass breakpoints on API and security solutions using hooks. The hashes in these checks are most likely correspond to sandbox or security products that the FinFisher authors want to avoid. Next, the loader checks that it’s not running in a virtualized environment (VMWare or Hyper-V) or under a debugger. For the hardware virtualization check, the loader obtains the hardware device list and checks if the MD5 of the vendor ID is equal to a predefined list. In our tests, the malware sample was able to easily detect both VMWare and Hyper-V environments through the detection of the virtualized peripherals (for example, Vmware has VEN_15AD as vendor ID, HyperV has VMBus as bus name). 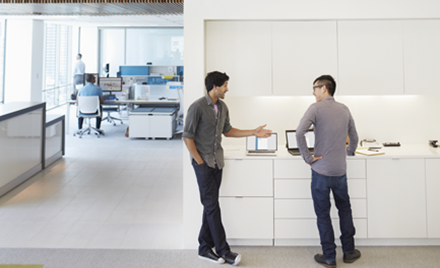 Office 365 ATP sandbox employs special mechanisms to avoid being detected by similar checks. Finally, if the loader is happy with all the checks done so far, based on the victim operating system (32 or 64-bit) it proceeds to decrypt a set of fake bitmap resources (stage 2) embedded in the executable and prepares the execution of a new layer of VM decoding. Each bitmap resource is extracted, stripped of the first 0x428 bytes (BMP headers and garbage data), and combined into one file. The block is decrypted using a customized algorithm that uses a key derived from the original malware dropper’s TimeDateStamp field multiplied by 5. The 32-bit stage 2 malware uses a customized loading mechanism (i.e., the PE file has a scrambled IAT and relocation table) and exports only one function. 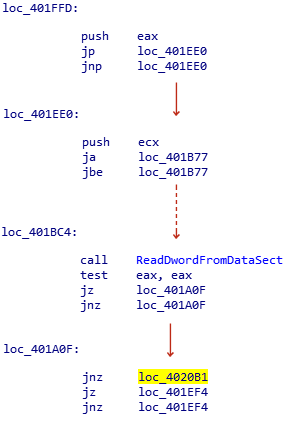 For the 64-bit stage 2 malware, the code execution is transferred from the loader using a well-known technique called Heaven’s Gate. In the next sections, for simplicity, we will continue the analysis only on the 64-bit payload. 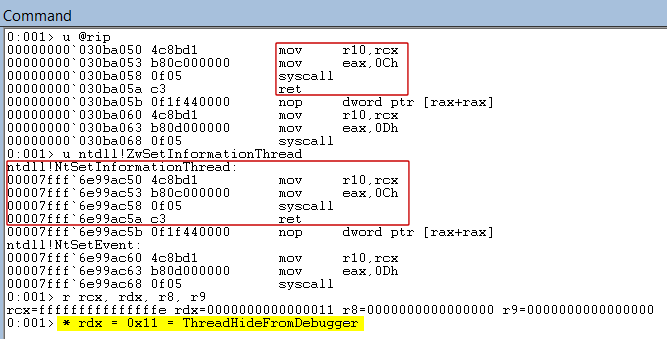 The 64-bit stage 2 malware implements another loader combined with another virtual machine. The architecture is quite similar to the one described previously, but the opcodes are slightly different. After reversing these opcodes, we were able to update our interpreter script to support both 32-bit and 64-bit virtual machines used by FinFisher. This additional virtual machine performs the same duties as the one already described but in a 64-bit environment. It extracts and decrypts the stage 3 malware, which is stored in encrypted resources such as fake dialog boxes. The extraction method is the same, but the encryption algorithm (also XOR) is much simpler. The new payload is decrypted, remapped, and executed in memory, and represents the installation and persistence stage of the malware. Stage 3 represents the setup program for FinFisher. It is the first plain stage that does not employ a VM or obfuscation. The code supports two different installation methods: setup in a UAC-enforced environment (with limited privileges), or an installation with full-administrative privileges enabled (in cases where the malware gains the ability to run with elevated permissions). We were a bit disappointed that we did not see traces of a true privilege escalation exploit after all this deobfuscation work, but it seems these FinFisher samples were designed to work just using UAC bypasses. The setup code receives an installation command from the previous stage. In our test, this command was the value 3. The malware creates a global event named 0x0A7F1FFAB12BB2 and drops some files under a folder located in C:\ProgramData or in the user application data folder. The name of the folder and the malware configuration are read from a customized configuration file stored in the resource section of the setup program. When running under a limited UAC account, the installer extracts d3d9.dll and creates a persistence key under HKCU\Software\Microsoft\Windows\Run. The malware sets a registry value (whose name is read from the configuration file) to “C:\Windows\system32\rundll32.exe c:\ProgramData\AuditApp\d3d9.dll, Control_Run”. Before doing this, the malware makes a screenshot of the screen and displays it on top of all other windows for few seconds. This indicates that the authors are trying to hide some messages showed by the system during the setup process. When loaded with startup command 2, the installer can copy the original explorer.exe file inside its current running directory and rename d3d9.dll to uxtheme.dll. In this case the persistence is achieved by loading the original explorer.exe from its startup location and, using DLL side-loading, passing the execution control to the stage 4 malware (discussed in next section). Finally, the malware spawns a thread that has the goal to load, remap, and relocate the stage 5 malware. In this context, there is indeed no need to execute the stage 4 malware. The msvcr90.dll file is opened, read, and decrypted, and the code execution control is transferred to the RunDll exported routine. In the case of 32-bit systems, the malware may attempt a known UAC bypass by launching printui.exe system process and using token manipulation with NtFilterToken as described in this blog post. The procedure starts by enumerating the KnownDlls object directory and then scanning for section objects of the cached system DLLs. Next, the malware enumerates all .exe programs in the %System% folder and looks for an original signed Windows binary that imports from at least one KnownDll and from a library that is not in the KnownDll directory. When a suitable .exe file candidate is found, it is copied into the malware installation folder (for example, C:\ProgramData). At this point the malware extracts and decrypts a stub DLL from its own resources (ID 101). It then calls a routine that adds a code section to a target module. This section will contain a fake export table mimicking the same export table of the original system DLL chosen. At the time of writing, the dropper supports aepic.dll, sspisrv.dll, ftllib.dll, and userenv.dll to host the malicious FinFisher payload. Finally, a new Windows service is created with the service path pointing to the candidate .exe located in this new directory together with the freshly created, benign-looking DLL. In this way, when the service runs during boot, the original Windows executable is executed from a different location and it will automatically load and map the malicious DLL inside its address space, instead of using the genuine system library. This routine is a form of generic and variable generator of DLL side-loading combinations. Figure 10. Windows Defender ATP timeline can pinpoint the service DLL side-loading trick (in this example, using fltlib.dll). In the past, we have seen other activity groups like LEAD employ a similar attacker technique named “proxy-library” to achieve persistence, but not with this professionalism. The said technique brings the advantage of avoiding auto-start extensibility points (ASEP) scanners and programs that checks for binaries installed as service (for the latter, the service chosen by FinFisher will show up as a clean Windows signed binary). The malware cleans the system event logs using OpenEventLog/ClearEventLog APIs, and then terminates the setup procedure with a call to StartService to run the stage 4 malware. The malware opens the target service process. It allocates and fills four chunks of memory inside the service process. One chunk contains the entire malware DLL code (without PE headers). Another chunk is used to copy a basic Ntdll and Kernel32 import address table. Two chunks are filled with an asynchronous procedure call (APC) routine code and a stub. It opens the service thread of the service process and uses the ZwQueueApcThread native API to inject an APC. The APC routine creates a thread in the context of the svchost.exe process that will map and execute the stage 5 malware into the winlogon.exe process. The injection method used for winlogon.exe is also interesting and quite unusual. We believe that this method is engineered to avoid trivial detection of process injection using the well-detected CreateRemoteThread or ZwQueueApcThread API. Calculate the difference between this pointer and the User32 base address. After this function pointer hijacking, when winlogon.exe makes any graphical call (GDI), the malicious code can execute without using CreateRemoteThread or similar triggers that are easily detectable. After execution it takes care of restoring the original KernelCallbackTable. The stage 5 malware is needed only to provide one more layer of obfuscation, through the VM, of the final malware payload and to set up a special Structured Exception Hander routine, which is inserted as Wow64PrepareForException in Ntdll. This special exception handler is needed to manage some memory buffers protection and special exceptions that are used to provide more stealthy execution. After the VM code has checked again the user environment, it proceeds to extract and execute the final un-obfuscated payload sample directly into winlogon.exe (alternatively, into explorer.exe) process. After the payload is extracted, decrypted, and mapped in the process memory, the malware calls the new DLL entry point, and then the RunDll exported function. The latter implements the entire spyware program. Our journey to deobfuscating FinFisher has allowed us to uncover the complex anti-analysis techniques used by this malware, as well as to use this intel to protect our customers, which is our top priority. Analysis of the additional spyware modules is future work. It is evident that the ultimate goal of this program is to steal information. The malware architecture is modular, which means that it can execute plugins. The plugins are stored in its resource section and can be protected by the same VM. The sample we analyzed in October, for example, contains a plugin that is able to spy on internet connections, and can even divert some SSL connections and steal data from encrypted traffic. Some FinFisher variants incorporate an MBR rootkit, the exact purpose of which is not clear. Quite possibly, this routine targets older platforms like Windows 7 and machines not taking advantage of hardware protections like UEFI and SecureBoot, available on Windows 10. Describing this additional piece of code in detail is outside the scope of this analysis and may require a new dedicated blog post. Exposing as much of FinFisher’s riddles as possible during this painstaking analysis has allowed us to ensure our customers are protected against this advanced piece of malware. Windows 10 S devices are naturally protected against FinFisher and other threats thanks to the strong code integrity policies that don’t allow unknown unsigned binaries to run (thus stopping FinFisher’s PE installer) or loaded (blocking FinFisher’s DLL persistence). On Windows 10, similar code integrity policies can be configured using Windows Defender Application Control. 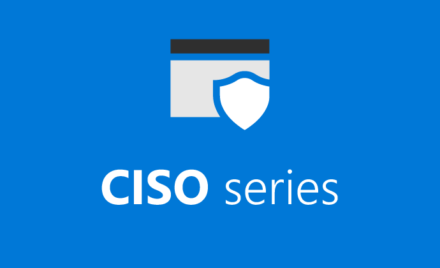 Office 365 Advanced Threat Protection secures mailboxes from email campaigns that use zero-day exploits to deliver threats like FinFisher. Office 365 ATP blocks unsafe attachments, malicious links, and linked-to files using time-of-click protection. Using intel from this research, we have made Office 365 ATP more resistant to FinFisher’s anti-sandbox checks. 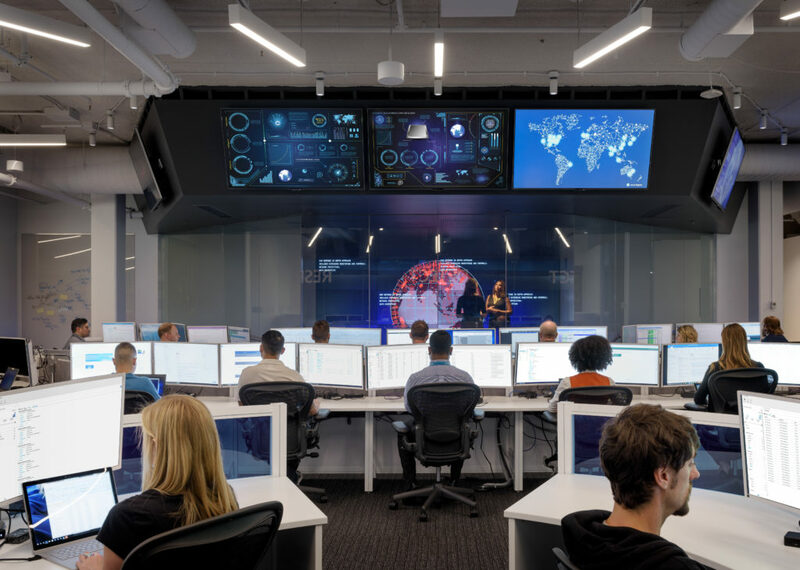 Generic detections, advanced behavioral analytics, and machine learning technologies in Windows Defender Advanced Threat Protection detect FinFisher’s malicious behavior throughout the attack kill chain and alert SecOps personnel. Windows Defender ATP also integrates with the Windows protection stack so that protections from Windows Defender AV and Windows Defender Exploit Guard are reported in Windows Defender ATP portal, enabling SecOps personnel to centrally manage security, and as well as promptly investigate and respond to hostile activity in the network.